On next year's Valentine Day your roses might be blue. 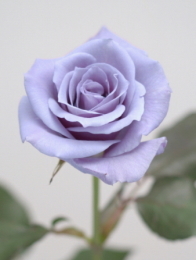 Suntory Ltd. has obtained government permission to market the world's first blue rose that it developed in 2004. The company plans to put it on sale in 2009 after building production facilities and sales outlets. Roses have no genes to create a blue pigment, and rose growers have long worked hard in vain to produce a blue rose. In English, blue rose is a synonym for impossible. Suntory organized a Blue Rose Development Team jointly with its Australian subsidiary in 1990 and successfully produced a blue rose by recombining a gene capable of creating a blue pigment taken from pansy, using gene-splicing technology. In the process of the research, the team has succeeded in developing a blue carnation, which is already on sale in Japan. A blue-like rose has already been produced by suppressing a red pigment through cross breeding and marketed in the world. But no rose with a blue pigment has ever been marketed yet. Source: Kansai Window, Kippo News, Vol.14 No.562, Wednesday, February 20, 2008.